In May of 2018 I became the Exhibits and Facilities Manager here at ExplorationWorks. Around that same time a truck left Louisville, Kentucky full of dog related fun. The new dog exhibit opened to the public on May 26th and it has been a hoot watching the kids interact with it. There are beautiful statues of various breeds and realistic stuffed dogs for the young ones to take for a walk on a leash. There will be a live dog event every Saturday at 10:30AM at ExplorationWorks, but I’ve noticed that kids treat the stuffed dogs as if they are live animals anyway. There’s a ton of great dog information for the grownups as well. Did you know that the early humans probably lived next to wolf packs on purpose so to scavenge their kills and to get fair warning of sneaky man-eating predators? Thanks wolf pals. You can also test out your sense of smell at several scent stations. I got a D+. I eat bananas almost daily and could not guess the banana scent. In my own defense - scents are a bit of brain trickery. Scents are not consistent from brain to brain as they are tied to specific memories. I could easily pick out my grandma’s lemon meringue pie, but carnation is a bit more elusive for my brain to detect. But don’t worry, it’s not all flowers and spices - there’s also some putrid smells. The answers are hidden so that you can watch the fantastic reactions of peoples faces as they take a big whiff of “decay”. It’s like feeding your toddler a lemon for the first time. Sure it’s a bit cruel, but totally worth the guilt when you see the reaction. There’s an Adoption Center with a computer program that can match you up with a breed of dog that will be a good fit for your family. Come find out what breed matches your ideal dog. Turns out that I should be walking around with a Tibetan Terrier by my side. There aren’t any live dogs at the adoption center so there’s no need to worry about anyone talking you into a new pooch, but there are several stuffed dogs for the kids to hang out with while they’re here. The best part of the adoption center is an area where visitors can tell us about their own dogs (..or lack thereof) with a sticky note. Whether you have a mutt or a Tibetan Terrier - there’s one truth to be learned at this exhibit: Humans need dogs and dogs need humans. Dogs: More Than Pets will be on exhibit through September 16, 2018. For more information on this exhibit, click here. stewardship at ExplorationWorks in Helena opened last month and has experienced constant kid traffic and increased membership for the science museum. The display was partially made possible by a $5,000 donation by NorthWestern Energy. “We got within $5,000 of our goal and then Howard called,” said Kelly Posewitz, executive director of ExplorationWorks, the children’s museum situated in the Great Northern Town Center next to the Great Northern Carousel in Helena. NWE’s Howard Skjervem, community relations manager for Helena, knew about what they would need to complete the project and called to offer the company’s assistance. Howard and Andy Welch, leader of hydro power license compliance, see an opportunity for future education of both children and their parents. Education ideas include how precipitation is routed through a watershed, how dams create water storage to supply water for later in the season and how water is aerated as it cascades over water falls that adds oxygen to the water to the benefit of fish and other aquatic life. The display also demonstrates to children how watersheds support multiple uses including hydropower, agriculture and recreation — all while supporting multiple fish and animals in its course. “Yeah, I could play with this for a while,” said Andy as he reconfigured eddies in the river stream of the display to allow a kayak to safely pass through. Already kids have enjoyed learning about dams as the museum has seen record numbers in the past two weeks. “And membership has gone through the roof,” Kelly said. The display uses 280 gallons of water that is recirculated throughout the display that includes a model of Mount Helena. There are three filtration systems keeping the water clean. “It’s been a really, really big hit. It’s been very popular,” said Kelly. It all started in 2005. Sam Thompson was an 8th grader and had an idea to build a hang glider simulator. Sam’s love of all things flight inspired him to try his hand at building the simulator with help from his father, Bill. After some experimenting and tinkering, the hang glider simulator made its debut at ExplorationWorks in 2007 as part of the Explore the Air exhibit. Fast forward to 2018. ExplorationWorks reached out to Sam, now a Rotating Equipment Engineer at an oil refinery in northwest Washington, to take a stab at revamping the hang glider in hopes of having it be a key piece in the current Take Flight exhibit. Sam accepted the challenge, travelled back to Helena, and spent a handful of days re-building and modifying the simulator he built over a decade ago. The Take Flight debuted in February of 2018, with the Sam’s hang glider as crown jewel of the exhibit. Kids of all ages (yes, this means adults too!) line up to take their turn on the simulator. We recently sat down with Sam to learn more about what prompted him to build the simulator in the first place, as well as what he hopes the exhibit will mean to the families that visit ExplorationWorks. What gave you the idea to build the simulator in the first place? I've always been interested in flying and was attracted to the simplicity of hang gliding. It's such a simple way to get in the air, and hang gliders are very simple machines, I figured it wouldn't be too difficult to make a device to simulate one. What has changed from the first version to the current? There have been several revisions of the Hang Glider Simulator leading up to this one that is currently on the exhibit floor. Initially, the design consisted of various hardware store parts crudely assembled with duct tape and zip ties in the garage. The 'harness' was nothing more than a piece of canvas supported by rope, and the structure was a metal tripod used for lowering heavy items down wells. The second revision consisted of a purpose build support frame, and a combination of gate hinges, wooden brackets and hose clamps for the control gimbal, which at the time was quite the upgrade! At one point the exhibit featured wind that would blow in the occupant's face proportional to the speed of the glider in the simulator. The latest revision consists mostly of machined parts, a real hang glider harness, and the latest in flight simulation graphics, to name a few things. What do you hope ExWorks visitors will take away from playing with this exhibit? First and foremost I hope it provides a fun, unique experience. If it is able to pique an interest in flying then that would be an added bonus. What do you recall when the simulator made its debut? When the Hang Glider Simulator was first exhibited, I remember that it was a big hit, despite the crude construction. We took it around to many different events and the reception was very positive. It's good at drawing a crowd because people enjoy watching others fly (and crash) on the big screen. What are you most excited about having this exhibit on display? I'm looking forward to seeing how it holds up relative to previous versions, in order to gain insight on future improvements that could be made. Does your love of flying play a part in what you like to do in your spare time? On my days off I'm actually a pilot and fly charters around the San Juan Islands. In addition, my wife and I have a plane which we use for everything from exploring the backcountry of the North Cascades to flying to the San Juan Islands for lunch. 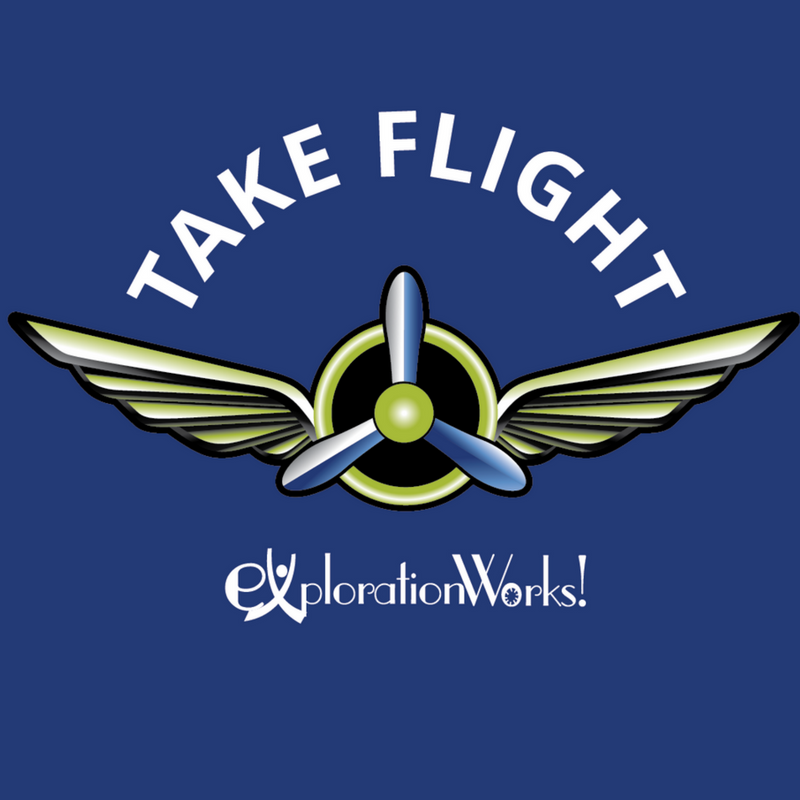 The Take Flight exhibit will be on display at ExplorationWorks through May 20, 2018. The hang glider simulator features a “flight of the day” with locations such as Mount Helena, the Frank Church River of No Return Wilderness, and Glacier and Yellowstone National Parks. We've officially got not only a new water table, but a new exhibit as well! The new water table was manufactured and installed by a company called Boss Display in Columbus, Ohio. They do water exhibits all over the world and we were pleased to partner with them on this project. The new water table is about three times as large as our previous one and has many interactive stations for visitors. There are local elements like the Fire Tower and the Sleeping Giant designed into the water table to connect Helena to the exhibit. In addition to the water table, we also have a new video kiosk titled Montana H20 Discovery that will highlight videos that deal with water topics all around Montana, including a video from the students at East Valley Middle School! The new exhibit, Take Flight, is a hands-on exhibit that explores the science behind flight. There will be a number of different interactive exhibit stations including a Hang Glider Simulator, Vertical Wind Tunnel and Flying Cups, RC Flight Simulators, Bernoulli Blower and educational videos provided by our lead sponsor Boeing. Take Flight will be on display through Memorial Day. We hope you can come and check it out!